DENVER (AP) — Emmanuel Sanders waited six long weeks to join the list of players who have caught a touchdown pass from Peyton Manning. Now, he has four in less than a week. Manning and Sanders connected for a trio of touchdowns Thursday night in the Denver Broncos’ 35-21 victory over the San Diego Chargers. With the Chargers’ banged-up secondary double-teaming red-hot receiver Demaryius Thomas, Sanders caught TD throws of 2, 31 and 3 yards. The last one followed Chris Harris Jr.’s interception of a flustered Philip Rivers. Rookie running back Juwan Thompson added two TD runs as the Broncos (6-1) tightened their grip on the AFC West over the Chargers (5-3), who lost their second straight game. Manning finished 25 of 35 for 286 yards. Sanders caught nine passes for 120 yards, and Ronnie Hillman added 109 yards on 20 carries. One of GM John Elway’s prized free agent acquisitions last offseason, Sanders called this “wide receivers’ heaven” when he joined the Broncos in the spring. He spent his first five games in a Broncos uniform piling up the yards — 473 of them — but wistfully wishing to become the 45th player to catch a touchdown pass from Manning. He finally did it by hauling in the first of Manning’s four TD throws Sunday night when the five-time MVP broke Brett Favre’s career touchdown throw total (510 to 508). Each time Thompson scored, Rivers and the Chargers responded with 80-yard drives that ended with touchdown catches by tight end Antonio Gates. His two scores gave him an NFL-best nine, tied with Denver’s star tight end, Julius Thomas, who was held out of the end zone for the second straight game. Gates’ first score was a 4-yard grab on fourth down, his second a 10-yard catch with 9 1/2 minutes left that made it 35-21. River finished 30 of 41 for 252 yards with three TDs and two interceptions. Brandon McManus missed a 53-yard field goal with six minutes remaining, giving the Chargers great field position, but safety Rahim Moore intercepted Rivers’ pass to Malcolm Floyd at the Denver 4 and the Broncos grounded it out from there. Sanders sliced across the back of the end zone to haul in his first TD from 2 yards out. His second score was a 31-yard beauty in which he roared past cornerback Richard Marshall and hauled in Manning’s pass as he sprinted across the goal line to make it 14-7 with 32 seconds left to in the first half. Denver’s second scoring drive came after officials reversed a Bubba Caldwell fumble on the kickoff following Rivers’ 2-yard TD strike to Keenan Allen, a score that followed Gates’ 31-yard catch on third-and-20 from the Denver 33. 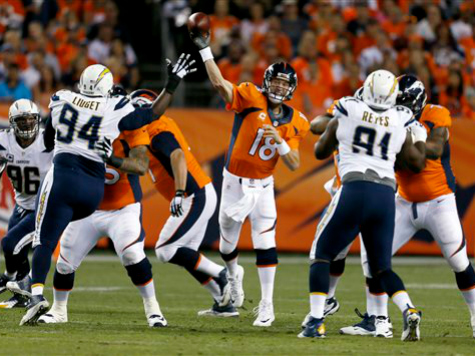 Neither team started fast offensively with Denver needing three drives to score and San Diego four. But the Broncos’ plan to better control the clock worked. The Broncos were held under 65 snaps just twice last season — both times by San Diego. The Chargers controlled the clock for more than 38 minutes in both games, including a 27-20 stunner at Denver on a Thursday night in December. That was Manning’s only divisional loss since heading West in 2012 and the Broncos’ only loss at home. This time, Denver had the ball longer than the Chargers. Manning was coming off an emotional four-TD performance Sunday night against San Francisco in which he surpassed Favre as the NFL’s touchdown pass king. Manning broke another of Favre’s records on this night, albeit a much more obscure one: he now has 16 seasons with 20 or more touchdown passes, one more than Favre. Manning is approaching another of Favre’s records, too. With his 157th career multiple TD game, Manning is two shy of Favre’s mark in that category. This marked just the eighth time in league history that a quarterback started a season with seven straight games with multiple touchdowns — and Manning’s done it three of those times. After losing at home to the Chargers on a Thursday night in December — Denver’s only home loss last season — the Broncos changed their work week. They practiced without pads and helmets. But their first two drives led to punts as defensive coordinator John Pagano again found ways to thwart Manning even with a banged-up secondary that was missing cornerbacks Brandon Flowers (concussion) and Steve Williams (groin). The Chargers also were missing linebacker Manti Te’o (foot). Then, Sanders starting finding the end zone.